YOBC’s top-tier Advanced Division wind ensemble for select students. YOBC’s Fanfare Winds is a 50-member wind ensemble under the baton of Steven Sweetsir. Sophomore and Junior musicians are eligible to participate in our annual concerto soloist competition. Students in Fanfare Winds may also be invited to play in one of YOBC’s full orchestras. 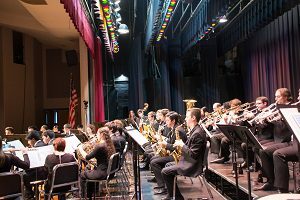 Fanfare Winds performs in an annual fall concert in November, a spring concert in April, and a Pops Concert in May. Other performance opportunities include field trips, extra concerts with either the entire ensemble or a chamber group, side-by-side concerts with local professional orchestras, and our international tours. Please see “YOBC Programs” for more information about these and other opportunities.